One of the top honours in the Atlantic Collegiate Athletic Association (ACAA) recently went to Christie Smith at the 2013 awards banquet in Fredericton. The award recognizes excellence in academics, athletics, leadership and sportsmanship. 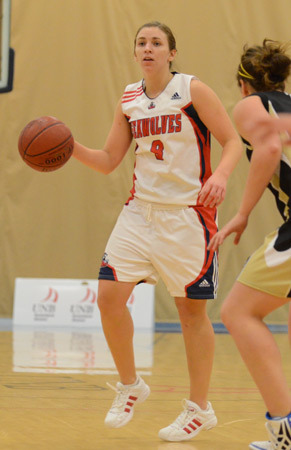 Christie was awarded the Rod Shoveller Memorial Award, which recognizes an outstanding student-athlete playing ACAA basketball for significant contribution to a sport and the community. "Receiving this award this year has been an awesome end to my athletic career at UNB Saint John," says Smith. "It really did put a cap on an already fulfilling time at the school, where I've definitely formed life long friendships and experiences I'll never forget, thanks to basketball." Off the court, Christie has a stellar academic career. She carries a 4.2 cumulative GPA into her final term while playing varsity sports. She also is an avid volunteer as the youth programs leader at a local church and is heavily involved in events such as Tidal Impact, a giant youth rally that will bring together approximately 2,000 Atlantic Canadian youth for a weekend. With her tenacious spirit and drive unseen in many student-athletes, Christie has pushed herself and her teammates from last place to competing with the best in the ACAA. Quick to offer congratulations to teammates on her own, and opposing teams, Christie's attitude is a positive example for other athletes. "It shows girls that they can still play at a competitive level and balance that with their academics at an equally high level," says Kevin Munroe, coach of the women's basketball team. Christie's passion, character and focus on the court make her a dream come true for a coach. Kevin Munroe is proud of the fact that she has received this award. "I am really proud of Christie. She works hard on and off the court and deserves this recognition." Smith will graduate from UNB Saint John in the spring of 2013.